3) EFFECT: More people are listening to FREE radio as opposed to buying new cds, mp3’s, etc. 4) EFFECT TO YOU: An advertising agency such as mine, is able to negotiate lower rates for you with radio stations than ever before because many stations need the advertisers. 5) EFFECT: You will be able to connect with your target customers on a lower budget than before and reach more of them. It really is a buyer’s market right now for radio advertising. In many markets an effective package that consists of frequent prime-time placement is going for 20% - 40% less than it was just one year ago at this time. This means big savings to you, with an even greater reach than ever before. You may be thinking “Advertising for less sounds great, but my customers are also buying less”. While that may be true, they are still buying – just being much more selective about these buying decisions. The key to be the winner of that ever important buying decision is being “top of mind” with your target customers. If your competition has cut back the advertising, this is the prime time to swoop in and build that awareness for your business. It’s still is all about being “top of mind”. You can throw in the towel now, or bring them back now, by being the first thing they think of when they need your product or services. 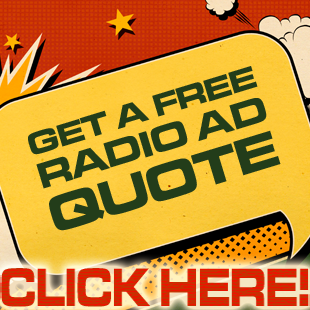 Radio commercials have always been one of the cheapest ways of reaching out to your target customers. How is this? Quite simple. When you consider the cost it takes to reach one thousand of your target customers through Print, Direct Mail, or countless other forms of advertising you are looking at costs reaching possibly into the Thousands! When you look at the cost of reaching one thousand people through radio commercials, you are looking at costs of $5-$12 per thousand, per hit. You tell me what makes more economic sense? Spending $3000 to reach 1000 people through a direct mail piece that 99.5% of people will likely toss in the trash, or spending that same $3000 to reach 200,000 people multiple times over through compelling radio commercials that will stick in their minds for months to come. How to bring the customers back! If you’ve seen a slow-down in new customers over the last quarter, you’re obviously not alone. While the average consumer is spending less and saving more, the importance of being on the top of that consumers mind has never been more important. Why is this? Because just as before the recession – When the consumer makes a purchase: 98% of the time it is because that vendor came to the top of their mind FIRST. Being FIRST in your target customer’s minds, needs to be your number one priority if new business and continued revenue plays any part in your business plan. While many business go in to “survival spending only” mode, it is often easy to fall into the trap of “starvation spending” and end up doing more harm than good while trying to make it through rough waters. Just as your body can survive on less food than you are currently eating, it will eventually die off if it is fed too little. The same goes for your business. So what “feeds” your business – customers? How do these customers come to know about your existence – marketing! So why is it that one of the first things business cut in times like this is the “marketing budget”?? If you already have a large base of customers that continue to come in and support your business, more power to you! You can cut back more than others, but if you rely on new business to survive, it is “business suicide” to completely cut out your marketing budget. Now the question to ask is – What works? Well, that depends on what you can realistically afford and what your customers will realistically respond to. Bottom line, almost any form of marketing can work if done right. Is it radio commercials? Is it TV commercials? Is it a magazine ad? Is it a banner ad on the net? The best thing to do is to discuss your options with a media professional who specializes in marketing matters. Most of the time they have your best interest at hand. Because just as you rely on your customers for return business, they rely on you for return business – this only happens if a marketing campaign is successful. It is always in their best interest to steer you in the right direction, as opposed to make a “quick buck”. They can discuss with you what has worked, where your budget may see the best results, and just how that marketing plan will likely impact your customers. While the times are tough, the key to survival and even moderate success in these tough times is not to become invisible to your customers. Cutting the marketing to slim to nil is a surefire ticket to planning that going out of business sale right now. The key is looking at what is realistic for you, and your customers. Make offers in your marketing that have a genuine appeal to potential customers, earn their trust, and turn that ever precious new business into a return customer… even in these trying times.